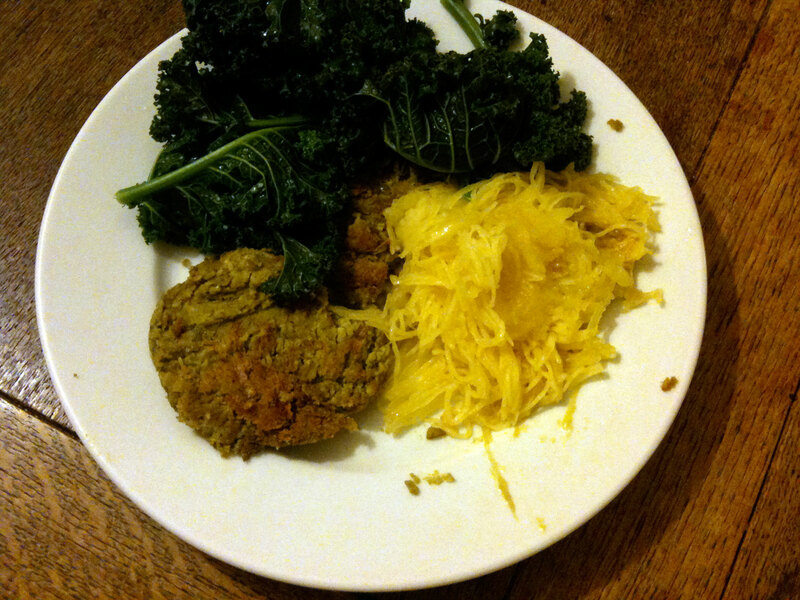 Last night’s dinner: Lentil Burgers** (legumes are ok when following the veggie version of the Whole 30), spaghetti squash (my first time making) and kale. Quite delicious, but I missed the butter. Butter is allowed, but only clarified butter. Not owning a cheesecloth, and already feeling like this whole venture involves a lot of channeling of Julia Child, I haven’t yet made the clarified butter. But I will. Day 5: Headache continues and 3pm fatigue is ridiculous. My head drops and feels like it weighs 50lbs. Other than that there is a pleasant feeling of virtuousness knowing that no sugar has passed my lips in 5 days. Not as sweet as chocolate (why does Mr OP have to leave an open bar of chocolate in the dining room!) but at least metaphorically sugar coated. The key thing about following this plan is preparation. I thought I had purchased everything I needed. But I’m out of ideas of what to eat for dinner tonight – and opening a jar of tomato sauce and smothering it over pasta (rice) topped with a soupcon of parmesan is off the table. Sigh. I haven’t purchased enough veggies or fruit or fish. And keep forgetting about the bloody cheesecloth! Fish. I still toy with going back to being a full on vegetarian, but then I remember my heritage (many fisherman on my maternal side of the family) and I concede the genetic tie overrides the guilt I have over the degree of their sentience. How sentient are salmon anyhow? Don’t tell me. Blend together above ingredients. Shape into patties. I tried both baking and frying them. The fried ones were much more delicious:) I used 1/2 olive oil and 1/2 coconut oil (~1tbs or so) seeing as I haven’t gotten the whole clarified butter thing together yet. Bake at 350 till solid. Depending on “wet” the mixture was to start takes anywhere from 25 to 40 min. Frying > Almost like making pancakes. Turn over when solid enough to flip. * A note about coconut flour, if you’ve never cooked/baked with it before. It is super absorbent. They should make paper towels out of it. Don’t treat it like regular flour. This entry was posted in Recipes, Whole 30 and tagged 30 days, chocolate, Day 5 Whole 30, sentience, vegetarian, vegetarian paleo, Whole 30, withdrawal symptoms Whole 30. Bookmark the permalink.